TV and movies have created a false belief in the usefulness and effectiveness of machine guns. The media depict heroes and villains alike using machine guns to spray hundreds, if not thousands, of bullets with almost pinpoint accuracy and controllability without ever reloading. This misrepresentation has fueled many questions in regards to machine guns for use in a survival application. The goal of this article is to correct this false belief and answer some of those questions. The difference between a semi-automatic and a fully automatic firearm centers on the trigger design. Simply put the trigger on a semi-automatic firearm is designed to fire one shot per one depression of the trigger. Press the trigger backwards once and the weapon fires one shot. The trigger of a fully automatic firearm is designed to fire multiple rapid shots with one depression of the trigger. Depressing the trigger backwards and holding it back allows the weapon to fire continuously. To stop the continuous firing, you stop depressing the trigger. Fully automatic weapons can fire up to seven hundred and fifty rounds per minute or more. This is known as a cyclic rate of fire, and it varies with each model. This seven hundred and fifty rounds per minute breaks down to 12.5 shots per second, so a thirty or thirty-two round submachine gun magazine will be emptied in less than three seconds which is why they require frequent reloading. This therefore requires carrying numerous additional loaded magazines. This additional weight must be carried by the shooter. This reduces their tactical mobility and increases the effects of physical fatigue. you have multiple machine guns facing towards an enemy using controlled overlapping sectors of fire, their high cyclic rate of fire combined with a lateral sweeping motion of the machine guns creates and almost in- penetrable wall of bullets. This is why machine guns were so effective in World War I, when large areas of open ground laid between the Allies and the German forces. 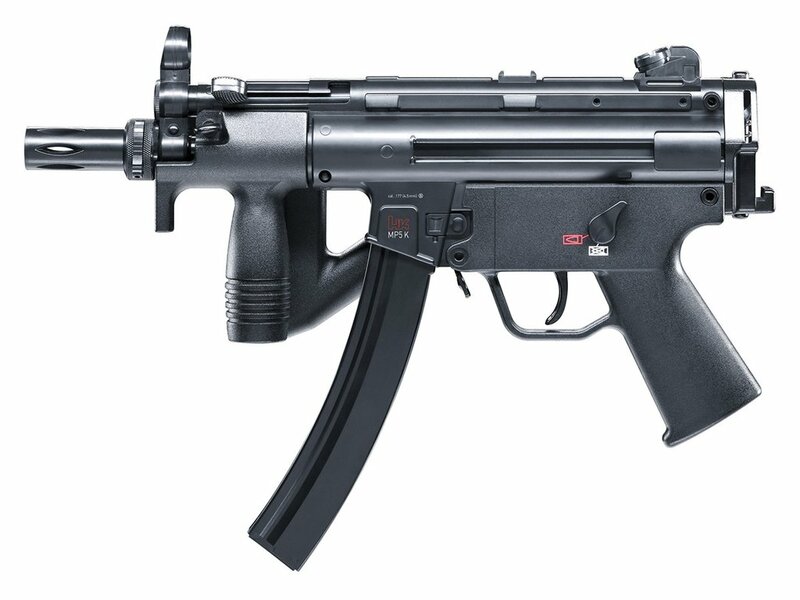 Submachine guns like those you see in TV and movies are portable automatic firearms that use pistol type ammunition and are fired from the shoulder or the hip. The use of pistol calibers reduces the recoil, but it also reduces the effective range at which they can be accurately used, and their high cyclic rate of fire still makes them very difficult to control. So, submachine guns have limited tactical applications. With the right training a shooter can fire three, controlled, accurate shots per second with their semi-automatic firearm. This is far less than the fully automatic rate of 12.5 shots per second, but the accuracy makes it more effective. Furthermore, only an accurate headshot or severing the central nervous system will cause instant incapacitation of an attacker. This is documented by FBI research in U.S. Department of Justice, Federal Bureau of Investigation, Firearms Training Unit, FBI Academy, “Handgun Wounding Factors and Effectiveness” (Quantico, VA, July 14, 1989). Absent a headshot, multiple, fast, accurate torso hits are required to stop an attacker. This is documented in a five year study on real police shootings made by “Police Marksman Magazine” titled “Stopping Power”. This is why focusing on weapons selection should not be your main emphasis. Instead one should focus on taking a personal defense shooting program which teaches techniques to deliver multiple, fast, accurate hits. This is why most tactical law enforcement units and military special operations units now prefer using their rifles in semi-automatic mode rather than fully automatic for the vast majority of the operations. They are most effectively used to fire multiple rapid shots at a specific location forcing adversaries to stop firing at you and take cover. This is known as suppressing fire. Once the adversaries are suppressed, you can take advantage of the situation you created by escaping or moving forward to close the distance between you and your adversaries or attacking them from the right or the left sides using what is known as a flanking movement. Submachine guns can also be very effective when they’re used to focus multiple rapid shots on a group of adversaries that are in close proximity to each other. Both of these tactics can be even more effective if submachine guns can be focused from two separate directions at a ninety degree angle from each other. This creates overlapping sectors of fire on an adversary. These type of tactics make submachine guns useful in urban situations. Once in a great while movies can get it right. In the movie “Heat” released in 1995 and directed by Michael Mann; it showed the best application of suppressing fire in one of their shootout scenes. The character played by actor Van Kilmer uses an M4 submachine gun to suppress numerous law enforcement personnel which enabled his team of bad guys to make their escape. We just described the limited uses of machine guns in real world applications which makes them impractical for use in the vast majority of all survival situations. The semi-automatic shoulder fired or handheld firearm is your most practical personal survival option. With the right training, they will enable you to get accurate single hits on targets at distances up to 300 meters (or more) as well as multiple accurate hits, at close range, on multiple targets and under low light. Semi-automatic firearms can be converted to fully automatic. Writing or explaining how to make this conversion is legal, because it is covered under the First Amendment right to freedom of speech; however, actually converting a semi-automatic firearm to fully automatic is illegal and can be prosecuted at both the state and federal levels. You can also be prosecuted if you are caught in possession of an illegally converted semi-automatic firearm, even though you did not personally make the conversation. Private individuals can own fully automatic firearms, if they file the proper paperwork, receive specific licensing through the appropriate federal agency (BATF) and pay the mandatory $200 tax stamp fee per fully automatic firearm. Currently the purchase price of existing fully automatic machine guns are in the tens of thousands of dollars, so they are far beyond the financial reach for most of us. Recently an accessory has been developed which legally allows the private individual to fire their semi-automatic rifle as fast as a fully automatic firearm. This accessory is known as a “Slide Fire” stock or as it is now more commonly known as a “bumpfire” stock. This stock can be attached to many AR 15 rifle platforms and more recently even AK 47 platforms. It uses the firearm’s recoil to enable the shooter to repeatedly depress the trigger very quickly in a rapid fire mode and achieve almost the same cyclic rate of fire as a fully automatic firearm. It also has a built-in lever mechanism which allows you to fire your semi-automatic rifle in single shot or rapid fire mode. No machining is required, so it can be installed quickly with a no formal training using only a long screwdriver or appropriate allen wrench and very little effort. It gives you the legal ability to have the best of both worlds. You can use your semi-automatic firearm as a signal shot firearm for controllable, fast, accurate, multiple hits on individual or multiple adversaries and use that same weapon in the limited effective applications of a fully automatic firearm. I last saw the “Slide Fire” accessories selling for $125 to $150. Machine guns and fully automatic firearms add a great deal of excitement to TV shows and movies, but their tactical and practical applications are very limited in a real world setting. These limitations make them undesirable for use in the vast majority of survival applications. In a nutshell machine guns/submachine guns are too uncontrollable to win a gunfight that’s going to occur up close, fast, under low light, possibly involving multiple adversaries, and they waste too much ammunition. If the shot you just fired didn’t hit your target, you wasted that round of ammunition. When it comes to winning a gunfight you need controllable, fast, accurate, multiple hits on target(s) and in a survival situation ammunition maybe in limited supply, so every round must hit its target.